Vicente Guaita's agent Vicente Fores said that FC Barcelona is interested in his client and wants to bring him at Camp Nou, but that Vicente Guaita is only focused on Valencia CF. 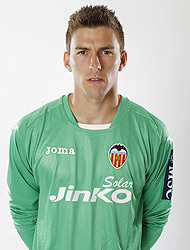 He said that Vicente Guaita isn't as pleased with his situation at Valencia CF as he could be, as he hasn't been starting regularly, but said that Guaita is focused solely on Valencia CF right now. That said he confirmed that one of the goalkeepers is very likely going to leave in the summer and said it could be either Guaita or Diego. We knew this before of course, its been obvious two very quality goalkeepers can't feature so irregularly and one of them will have to go in the summer. As I've written about it, Manuel Llorente would like Guaita to stay because he is Valencianista and he has pressure from the fans to have more Spanish players at the club. Ultimately it will depend on how each of the goalkeepers perform, Valverde's input and which one gets the higher offer. I believe Guaita has stronger chances of staying, but if there is a big offer for him and Diego has been performing better, Guaita could leave. Its said that FC Barcelona are willing to spend about 15 million on a new goalkeeper, Guaita's release clause is at 20 million euros, so he is fairly safe from a buy-out, but only has two years left on his contract.